Yes, you heard it right. There is going to be another Crocs Mega Sale this year. 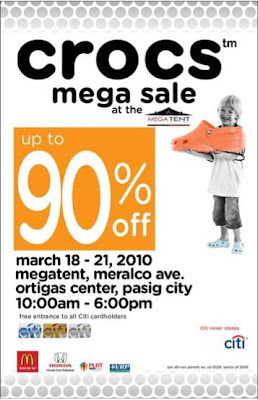 It's happening on March 18-21, 2010 at the Mega Tent in Pasig from 10:00 AM to 6:00 PM. If you're planning to go but have never been to one, check out my post from last year on what to expect from a Crocs Mega Sale event. Make sure to bring companions to fall in line for you because the long lines are sure to be a source of hair loss for women and major grumpiness in men (unless they love shopping as well). And leave the babies at home! The summer heat and the crowd will all just be taxing to a child. Up to 90% off! Go, go, go!! !